If luxury and superlative adventures call out to you, then you know your heart belongs to Dubai. Filled with unique, and rich experiences, when you leave you carry along an unshakable taste of opulence and magnificence. Be ready to be awestruck, enchanted and swept off your feet with luxury cars strutting down the roads, and skyscrapers gazing at the curious tourists. Get on the Emirates Airlines, and head straight to the man-made cocoon of an exotic bliss. Here are 5 amazing things you can do in Dubai. 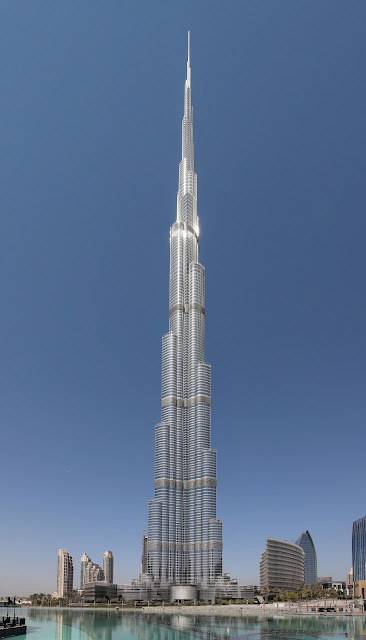 If you get your kick from skyscrapers, take the elevator to the 124th floor of world's tallest building standing erect in Dubai. Hold on to your hat,the elevator will satiate your need for speed and take you to the top within seconds. Absorb the picturesque views while you capture the panoramic beauty with your camera. The Burj Khalifa Station is a ten minute walk away and you can buy tickets in advance online. Indulge in the flavour of Bedouin existence from when the Dubai skyline was more sand than concrete. While various companies offer a desert safari, find out details about stops, costs, food etc beforehand. Most start with a 4x4 drive to an authentic Bedouin campsite where you can try 'hubbly bubbly' (shisha tobacco). An adrenaline pumping ride around the dunes by Land Rover or camel will be the highlight of your trip. When the sun sets, enjoy the crimson sky fading into darkness lit by a blanket of stars. Get the best of the both worlds -desert and ski slopes only in Dubai. Don't miss Ski Dubai in Mall of the Emirates at the Marina end of the city, close to Burj Al Arab. Don't fret about the sudden drop in temperatures, they have all the equipments and facilities to prepare you for this exciting experience. Enjoy a cup of hot chocolate midway up the ski slope and recharge your energy. Dubai knows no compromise. While you've been thinking about all the places you'll see, from up above in Emirates Airlines, this one is not to be missed! If fine dine has become a run of the mill experience for you, shake things up by booking a table at Noire. Heighten your taste buds as your sight won't have much work to do there. Dinner takes place in complete darkness, with waiters equipped with night vision goggles to lead you to your table. Located in Fairmont, you can take the metro to the World Trade Centre and head to the gastronomic experience of a lifetime. You don't have to fly to Jordan to float in the Dead Sea, at least for now. While you're in Dubai, you can get a mini Dead Sea preview by visiting the Saray Spa at JW Marriott Marquis. The signature Dead Sea Journey includes rejuvenation in a private flotation pool, salinated with minerals imported from the Dead Sea to recreate that effect. Also get a scrub, mud mask and massage – heavenly. There are tons of things to do in Dubai. From romantic evenings to a day out with the otters, speaking to the fishes at the aquarium to experiencing the 3rd fastest elevator of the tallest building in the world, the possibilities are endless. Get your folks, and head on the journey of a lifetime. There's an Emirates flight leaving every now and then, pick any and get going!